People rely on personal finance advisors to help them make sound financial decisions that will affect their lives and to ensure they have a comfortable future. For this reason, your employer will also want to read in your financial advisor resume that you have good interpersonal and customer relations skills as well as wealth planning abilities for investments, retirement, and college savings. 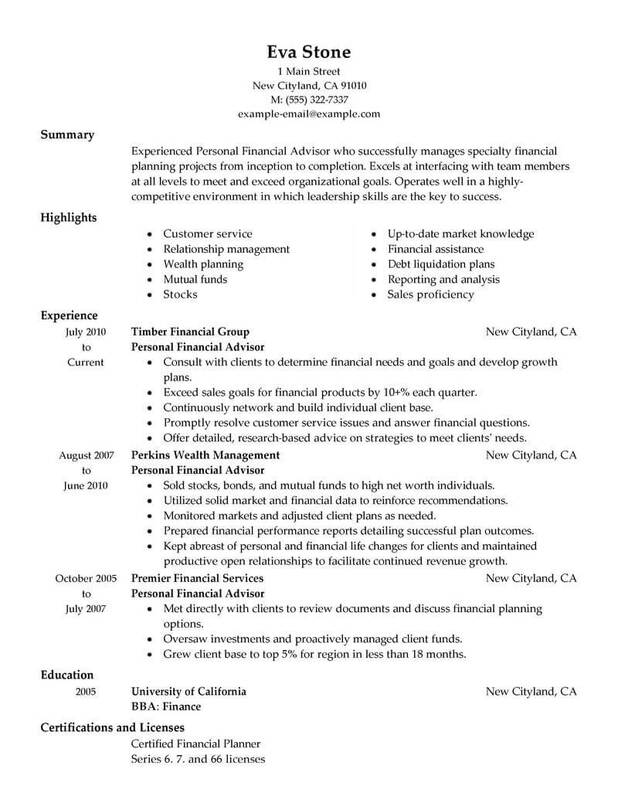 Our financial advisor resume example will show you what content to include in a section on your financial advisory experience. 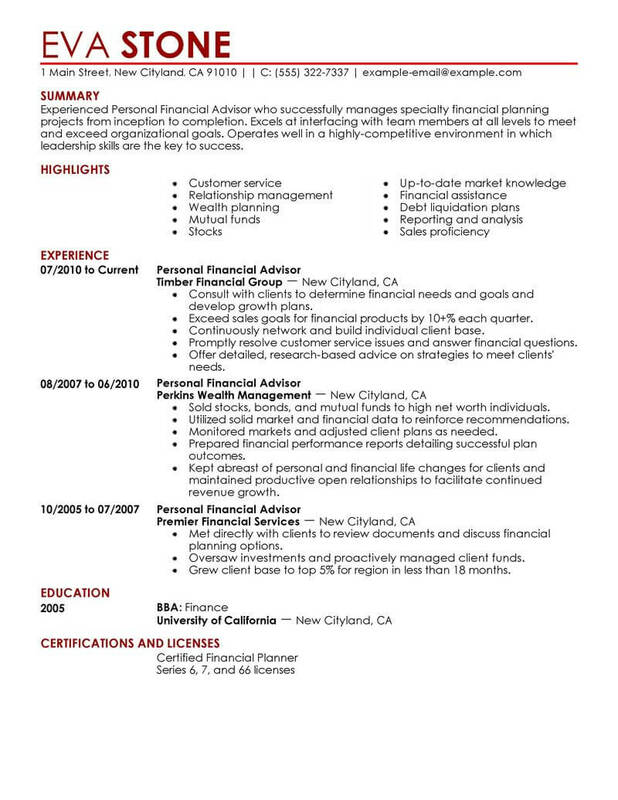 Besides your bachelor’s degree, your resume should include all certification and licenses to prove that you are a certified financial planner. Personal finance advisors give advice to help people make financial decisions that affect their lives. 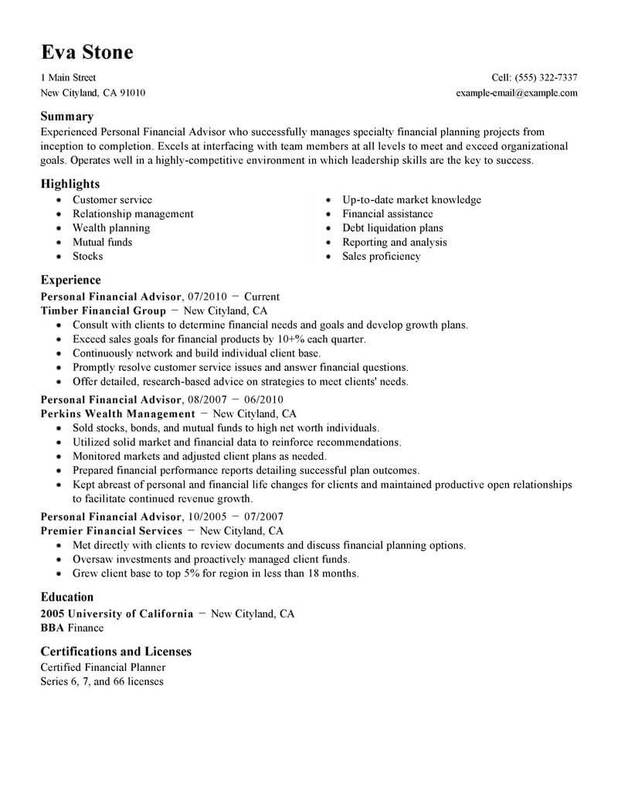 These resume examples are meant to help personal financial advisor job candidates build better resumes, so they can get hired sooner. Click on any of the resume examples below to review, then move on to create your own resume, using the sample content as a guide. Start now and put yourself on the path to a new career. The hunt for jobs as a personal financial advisor can be challenging, but with the right mental approach and a solid process, you can get ahead of the competition. Keep reading for a few ways you can improve your chances. 1. Craft a plan. If you are between jobs and in need of money immediately, consider applying for government benefits and assistance or getting a temporary job to pay the bills in the interim. 2. Keep a positive attitude. Though it can be hard to do when the search drags on for long periods of time, know that you are showing initiative and perseverance by continuing to apply. 3. Stay in touch with friends and acquaintances. Don’t be afraid to exchange contact information with new people as well. One of them could very well have a tip that leads you to an interview. 4. Ask about your application status. Unless you get a definite no or yes from a company, keep contacting their recruiting office to show your interest and determination. 5. Follow company workers on social media. The chances are that some of these people are looking at profiles like yours to quickly find candidates. Monitoring their activity in turn might result in a tip about a job opening that won’t be found elsewhere. 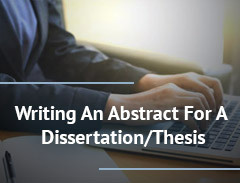 Having a well-written and focused resume is still a critical element in finding the jobs as a personal financial advisor that are right for you. Here are a few suggestions for making your document the best it can be. 1. Consider creating an original template. With cleanliness and readability in mind, a design that you make is sure to immediately stand out from other resumes created using identical templates. 2. Include your best contact information. Give potential employers your email address, phone number, city, state and website URL if possible to allow them several ways to get in touch with you about the status of your application. 3. Avoid using language such as responsibilities included when writing about your work history. Jobs descriptions aren’t nearly as remarkable to recruiters as specific contributions and accomplishments. 4. Assign number values to duties and accomplishments whenever you can. 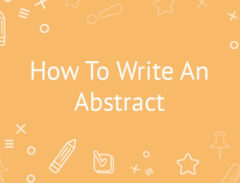 This specificity makes your previous work more memorable and shows some passion on your part. 5. Don’t be too rigid about sticking to one page. Most employers are more than happy to look over resumes between one and two pages as long as the information in the document is relevant.